BDP can send automated SMS messages via the rules engine, however you need to ask us to first activate SMS in your account. SMS messages cost 10p per message of 160 characters. More than 160 characters will incur an additional message charge. Maximum characters in a single ‘send’ 520 at a cost of 4 credits. SMS is disabled by default. Contact support to activate. 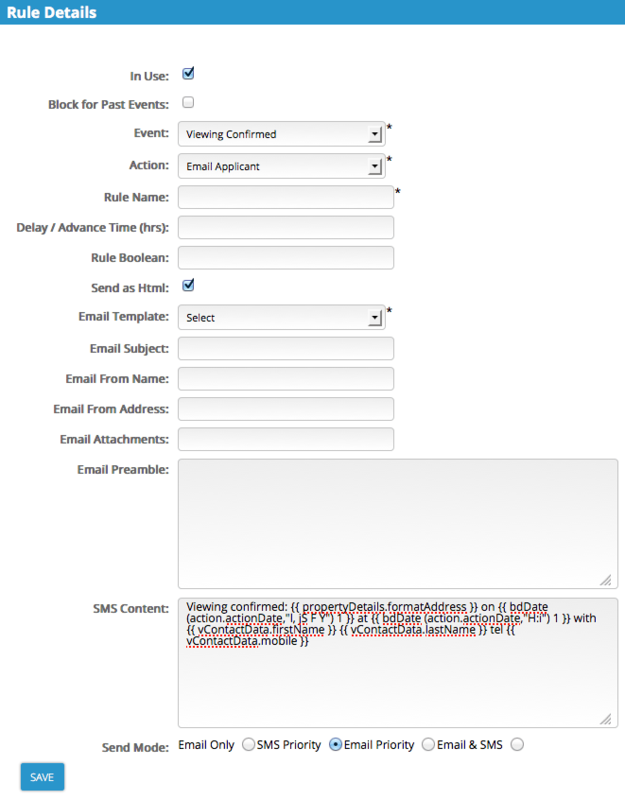 Let’s now look at how to add an SMS message rule. In the Configuration menu in BDP, go to the Business Rules widget and click to add a new rule. In this example we’re going to send an SMS to the Applicant to confirm the location, date and time of a viewing they have booked. If you want to send the message some time before the viewing, enter the Delay/Advance in hours. A negative figure, e.g. -2, will send the message two hours before the event. In the SMS content enter the message. The placeholder syntax is the same as for emails in BDP, i.e. double curly brackets surround the placeholder name. See this page for a full list. Select SMS Priority from the send mode. This is most important.